BALTIMORE, MD — It’s becoming as predictable as the sun rising in the east. Former Anamosa superstar and current Baltimore Ravens offensive lineman Marshal Yanda was named to the Pro Bowl team recently. 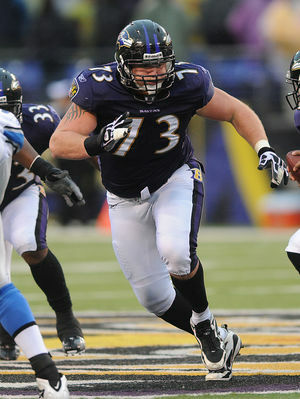 Yanda will be making his fifth straight appearance in the prestigious contest. While the Ravens’ season didn’t go exactly as planned this year, as Baltimore wrapped the 2015-16 campaign with a 5-11overall record after a 24-16 loss against the Cincinnati Bengals Sunday, Jan. 3, Yanda kept his play at an elite level all season long. “Football is the ultimate team sport, and you don’t do anything in the league on your own,” Yanda told the Baltimore Sun. “I want to thank the coaches and my teammates for helping me along the way this season. Yanda ties Haloti Ngata for the fifth most Pro Bowl appearances in a franchise history. Only Ray Lewis (13 Pro Bowls), Jonathan Ogden (11), Ed Reed (9) and Terrell Suggs (6) have gone to more Pro Bowls in Ravens history than the Anamosa native. Yanda was chosen to the Pro Bowl without regard to conference after a vote by fans, coaches and players. Yanda and the rest of the Pro Bowl selections will be assigned to teams during the Pro Bowl draft, set for Jan. 27. Not only was Yanda selected as one of the best in the NFL at his right guard offensive lineman position, but he also earned yet another prestigious honor being named the Ravens’ 2015 team MVP. Yanda has arguably been Baltimore’s best player for several years now as he continues to defy the tests of time by getting better each and every season.